A Great Way to 'Round the Bend! Racing was awesome last year. 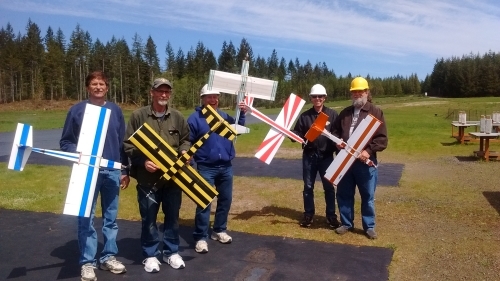 Congratulations to Terry, Duane and Rick for their first, second & third place finishes in the T-28 Class, and to Terry, Greg T. and Rick for their first, second & third place finishes in Reno Class. Click here for the final results of the 2018 Racing Season. After the April cancellation due to foul weather we've finally started over; the slate was wiped clean and the points race is on. The first races were held on May 5th (that's right Cinco de Mayo!) at 10:00 am. We had a group of nine racers show up for T-28, all singles no teams. Five committed for Reno with Neil coming up from Portland to join us again. Anyone wishing to compete in either or both classes that didn't make it is encouraged to turn out the first Saturday of June and join in. It's never too late to have fun flying in circles and the more the merrier! During the morning clinic, minor rule changes were discussed and the T-28 pictures were taken. Reno pilot pictures were taken at the first race in April due to the rain on clinic day. Seven of the nine T-28 racers were present for the morning clinic. Pilot Duane. Missing from picture but present for the first race were Jeff K. and Bruce S. A sample of race planes is shown. The February 2011 issue of Model Aviation has a story about the Chino Valley (Arizona) Model Aviators club which has been racing Parkzone T-28 Trojans for two years and reports great success. Aron "AJ" Seaholm wrote an article for Model Aviation that quoted Randy Meathrell regarding their methodology. If it works for them, why not give it a try? So, we did. The basic idea is to have a single type of rugged yet affordable airplane that everyone can race on equal footing. The all-foam Parkzone T-28 certainly meets these requirements. It's simple construction, availabilty of parts, and relatively low speed coupled with high maneuverability make it a great competitor. Restricting modifications keeps the costs down and places the emphasis on pilot skill and tactics. To bring the cost down further, the club has negotiated a discount on the Trojan with Hobby Town in Tacoma and Blue Sky Hobbies in Bremerton. For more information, contact the Race Coordinator. During 2013, there was some confusion about the name "Pylon Racing". According to the AMA Pylon Racing Competition Regulations: "The AMA recognizes four classes of RC Pylon Racing for US competition. All are intended for multi-channel RC aircraft powered by conventional 2-stroke glow engines" (see here). In order to eliminate the confusion, it was decided that T-28 Trojan racing would be referred to as "Park Flyer Racing". With the addition of the Reno Class, the events will now be refered to simply as Racing. At the conclusion of the 2014 season, it was decided to create a new class of racing, later named the "Reno" class. The intent was to open up racing to a wider variety of aircraft. The class is open to both electric and fuel-powered airplanes. Wingspan is limited to 50 inches, maximum flight weight permitted is 50 ounces and the top airspeed is limited to 75 mph. 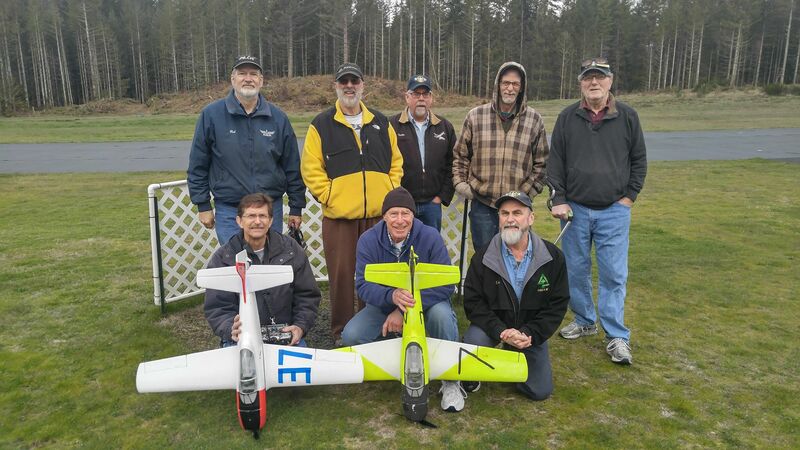 On May 5th, five Reno Class racers showed up for the first race & pictures. Pictured from left to right are Terry H., Rick, KC, Greg T., and Neil M.
We keep score using a points system loosely based on the system used in Formula 1 auto racing. Pilots are awarded points based on their finishing position in each Section.